Clean Cool Cotton Soft Body Lotion- I'm not super familiar with this brand but while I'm not a huge body lotion fan, I'm putting this on my nightstand. This has an interesting set of ingredients which includes retinyl palmitate and squalane. It's described as a lightweight moisturizing lotion with notes of Bergamot, Green Apple, Lemon Zest, Mimosa Blossom, Cooling Mint, Fresh Cotton Accord, Creamy Musks and Peach Skin (whatever that is!). Aaaand now I remember why I've heard of this brand but couldn't place it... they make perfume! 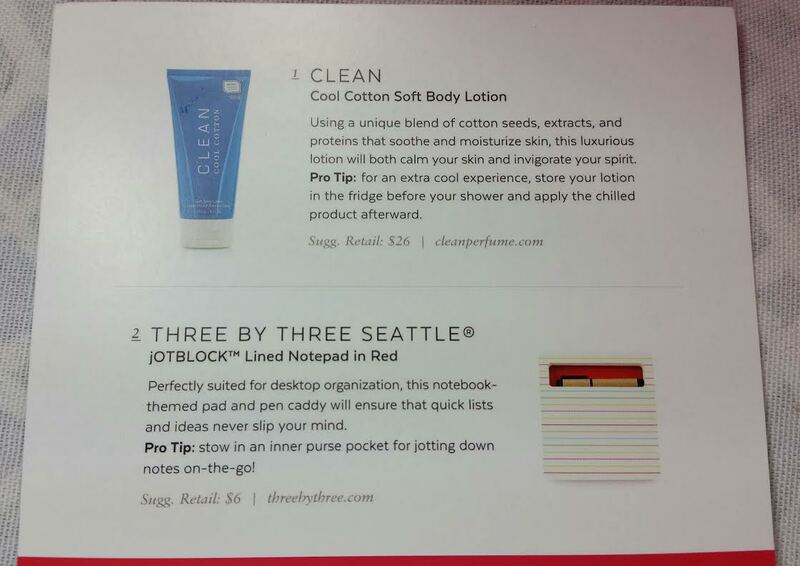 Three by Three Seattle JotBlock Lined Notepad in Red- This is SUPER cute! I love notepads of all kinds and this is adorable with it's special cut out to keep the included pen. I like the different colored lines on the pad, too. The pen writes smoothly, it's black and is wrapped in cardboard feeling paper. The only downside is that it's a little difficult to rip off the entire page because of the cutout part. Ah, well, the price I pay for cuteness. To Go Spa Replenishing Eye Mask- This is a pack of 3 pairs of eye gels. 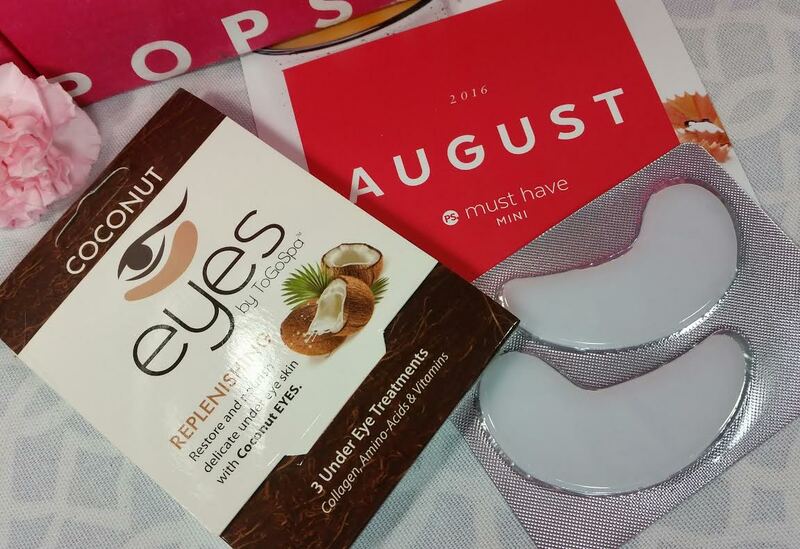 To Go Spa is actually a subscription itself that supplies eye masks, facial sheet masks and lip patches monthly. These are great at depuffing! I've received a box or two over the course of my subscription box addiction. The To Go Spa Society sends you masks and a natural beauty surprise each month. You can see my reviews here. VERDICT: I think this is the first box that I totally loved. So far it seems like there's been at least one item that I like but this is the first one where I'm keeping everything for myself like a hoarder. I really, really hope they manage to snag some other extras for the Minis. It really does make such a difference. 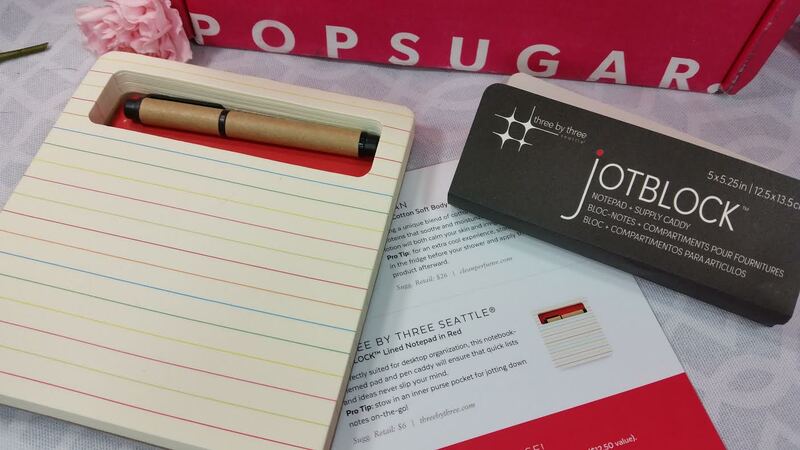 If you would like to sign up for the Popsugar Mini, you can do that here. If you sign up fast enough, you can get this exact box! Check to make sure on the website, though, since they can sell out at any time. 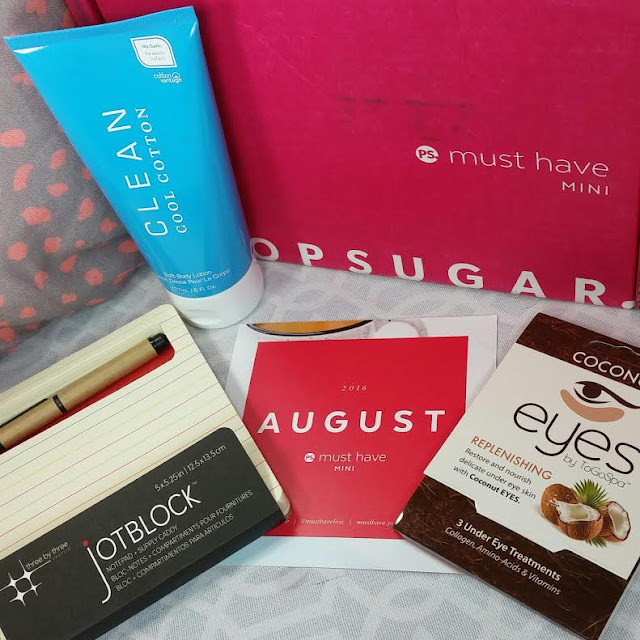 If you want to sign up for the regular Popsugar Must Have box, use code REFER5 for $5 off your first month. What do you think of the Mini? Is the value there for you? Do you think three items makes it better?